If you are considering taking your Medicine Elective in Peru, you will gain a great deal of valuable work-experience alongside skilled medical professionals. Our Medicine programme in Peru is based in the city of Cusco. We work with several hospitals in the city. The facilities are generally of a basic standard, although the huge disparity between rich and poor in Peru means that there are also a number of well-equipped private hospitals in the country. 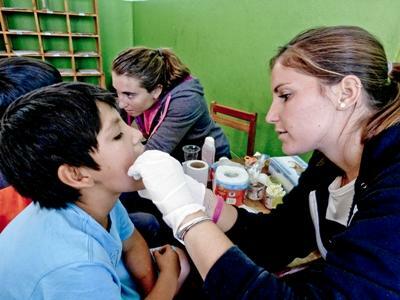 Projects Abroad are experienced in catering for students on their Medicine Electives. We can liaise with your university to ensure your requirements are met, and our in-country staff will be able to help co-ordinate your placement and work with you to complete any specific paperwork you may have. In Peru you will assigned a supervisor who will be a qualified medical professional. They will ensure your time is worthwhile and you learn from your time at the placement. They will discuss case studies with you and answer any questions you have. Be prepared to take notes. You will be very busy and will need to refer back to them. Our Projects Abroad Medical Supervisor has many years of experience in the social health sector in Cusco and provides regular group meetings with all the medical students. This allows you the opportunity to ask questions, reflect on the work you have been doing and learn about different topics related to the medical field in Peru. Your role will be mainly observational. You will shadow doctors and other medical staff throughout their day. You could be placed at Es Salud hospital, which is the biggest hospital in Cusco. This hospital is modern and well equipped and Elective students can work in a variety of departments with specialist medical professionals. If you are specialising in obstetrics and gynaecology, we also work with a specialist unit. There are also other hospitals and clinics available. For all Medicine placements in Peru, you need at least intermediate Spanish. You must also be able to commit to a minimum of two weeks to take part in this project. While you are in Peru you will stay with one of our local host families. Here you will be able to really improve your Spanish speaking skills. On your time off you will be able to explore the delights of Cusco and the surrounding area with our Projects Abroad volunteer community.